This is a sponsored conversation written by me on behalf of Wet Ones® Hand Wipes. The opinions and text are all mine. 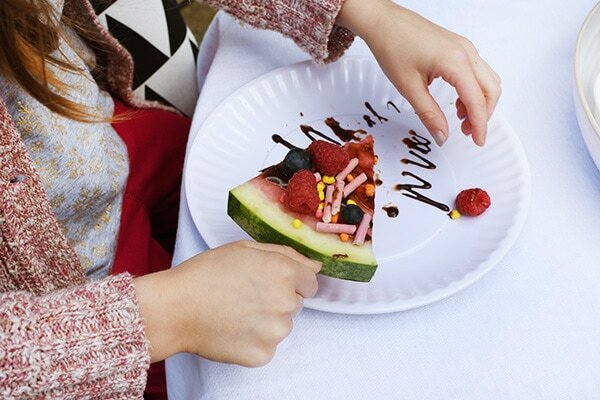 Nothing says warmer weather has arrived like enjoying a fresh slice of juicy watermelon! Today I am sharing how to take that slice of watermelon up a notch with just a few simple added ingredients. 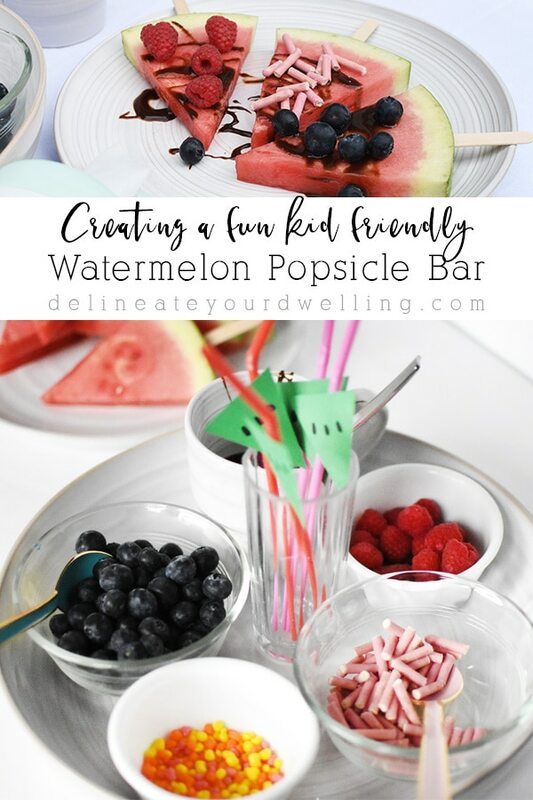 Keep reading for more details on Creating a Kid Friendly Watermelon Popsicle Bar! 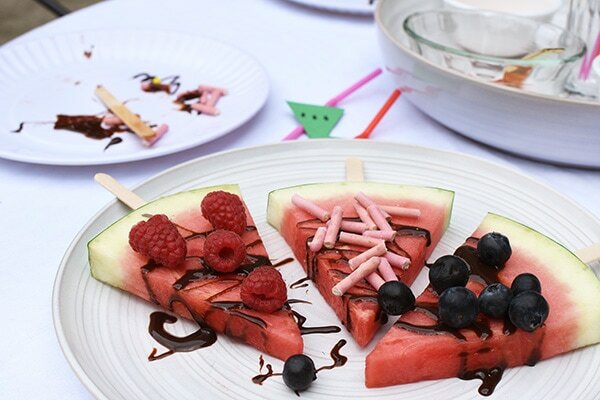 The first item to take care of is cutting your watermelon down into triangle shapes and inserting popsicle sticks. Note: Adding the popsicle sticks takes a bit of effort and should be an adult only activity. I had to use a knife to create a spot for the stick to insert. 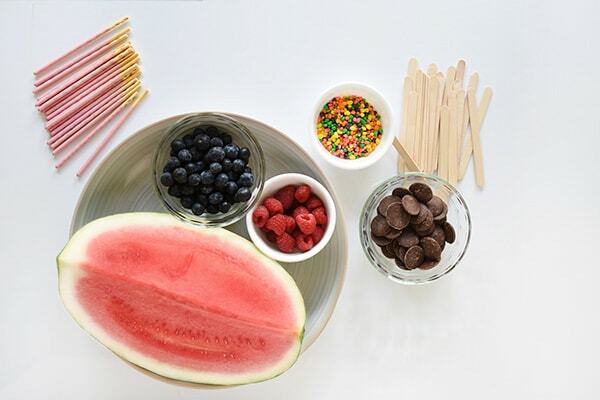 Once your watermelon slices (popsicles) are ready, it is time for all the fun toppings! 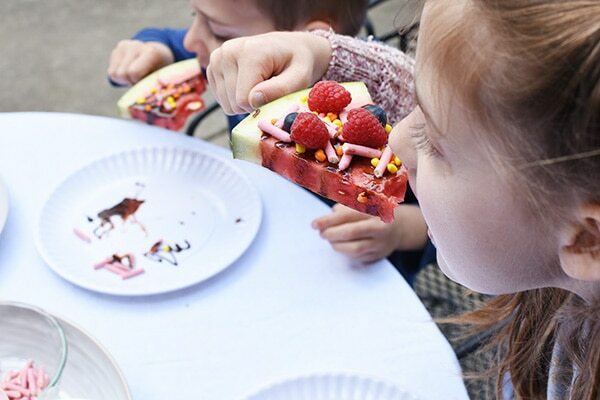 Set out a handful of small bowls to contain different kinds of delicious toppings for your kids to use in this tasty popsicle bar! Be sure to melt the chocolate according to the packaging and have a spoon ready to drizzle! After I had everything prepped and ready, my kiddos and I headed outside with all our watermelon supplies ready to enjoy! 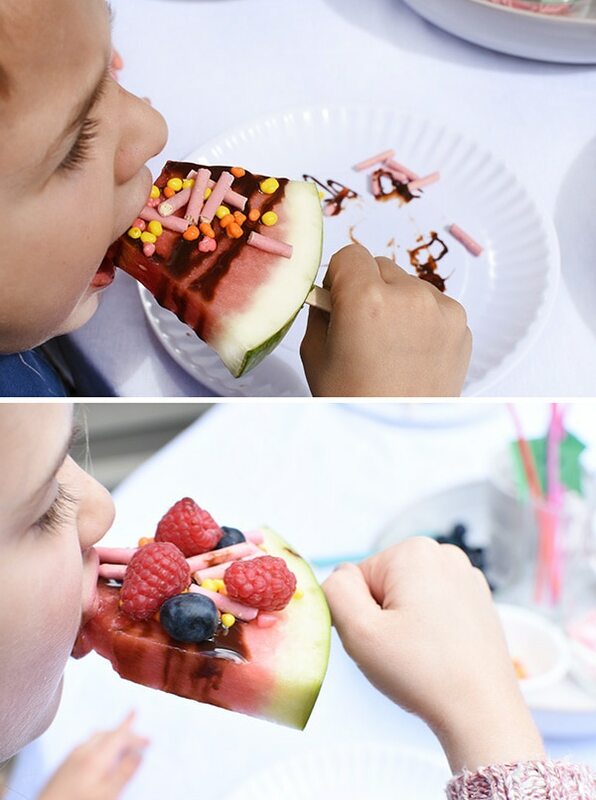 I made a few tasty treats for myself but they had such a fun time making their very own watermelon popsicles. My daughter drizzled the chocolate all by herself because she is a “big girl”. Then she added raspberries, blueberries, strawberry cookie sticks AND candy! I had to giggle due to their constant “Mmmm…” and “Ahhhhs…” in between watermelon bites! I think it was a big success! 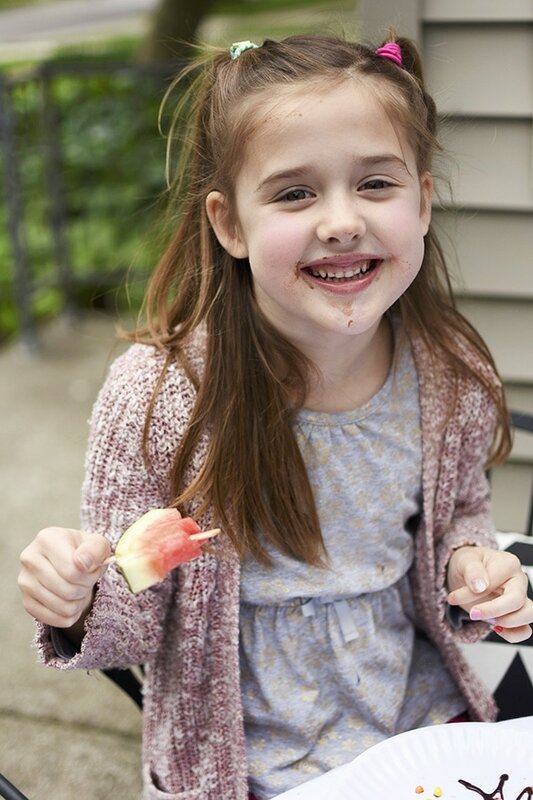 And you can see how much they enjoyed those watermelon popsicles… chocolate for days all over their hands! 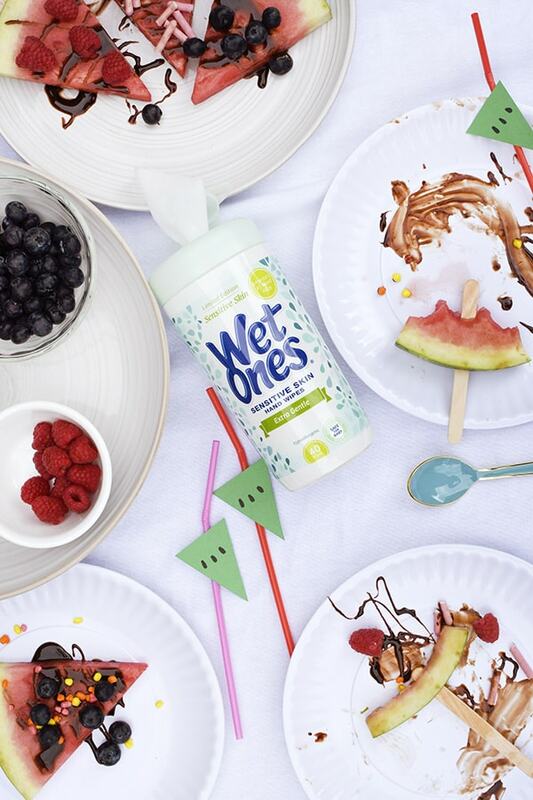 Wet Ones® Hand Wipes come in an antibacterial variety and kill 99.99% of germs and are tough on dirt and germs. I was so happy I had grabbed a package or two of Wet Ones® Hand Wipes to help save the day while we were outside and away from easy cleanup! My favorite Wet Ones® Hand Wipes are the travel packs which I always keep in my purse while we are running around town. They have been a lifesaver more times than I can say. 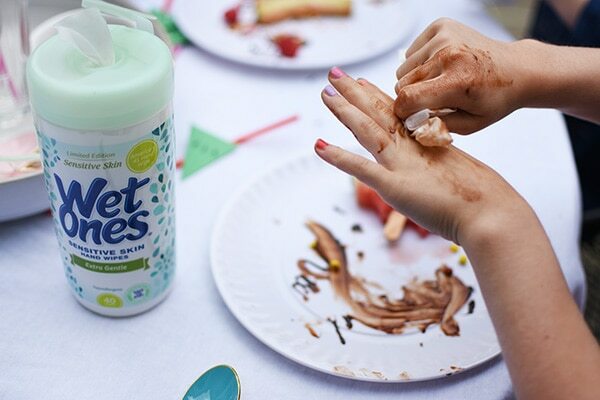 I love that Wet Ones® Hand Wipes, allow me to control unexpected messes! But more importantly they give me, as a mom, a peace of mind when we aren’t near soap and water. 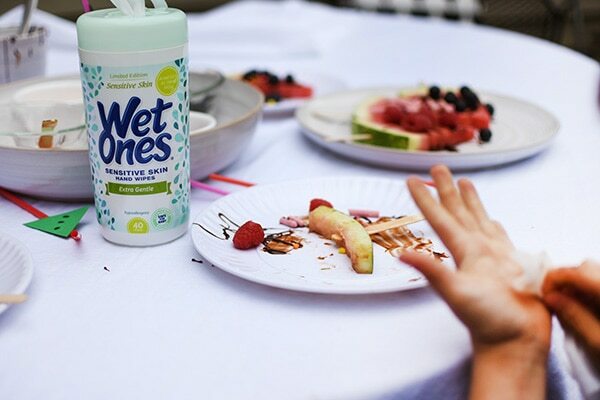 I love that while Wet Ones® Hand Wipes are tough, they also contain aloe inside each wipe, making them easy on skin for even the littlest of hands. Ready for the best part? 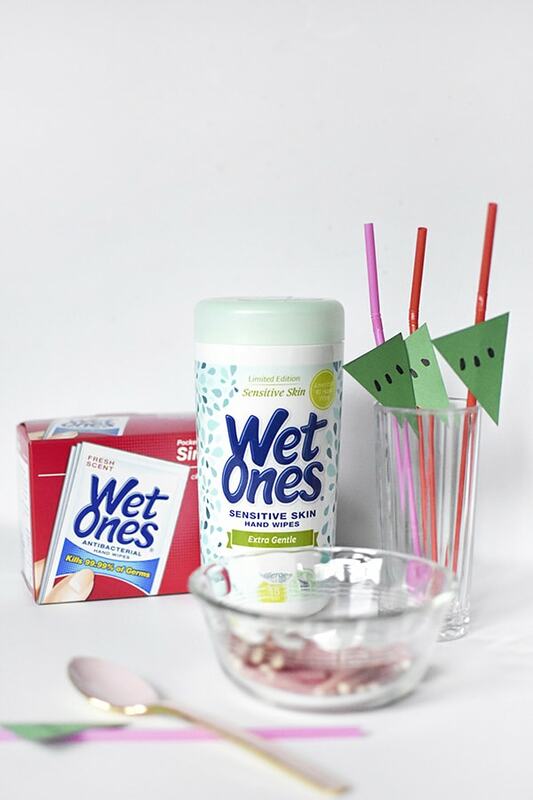 Wet Ones® Hand Wipes has a wonderful Summer Fun Giveaway! You could win some great instant prizes, too. What a smart, fun idea!! I LOVE this idea! I’ve never candy-ified watermelon, but I feel like that’ll be a thing this summer. And I love my wet ones! they’d be perfect for cleaning up messes at a watermelon bar. Your watermelon popsicles look so yummy!! I had never thought to put watermelon on chocolate but since chocolate is good on everything I bet it’s delicious. Also I don’t have kids but I keep a packet of wipes with me too because I’m really messy, lol! Absolutely brilliant! I bet the kiddos loved it! They had a blast with them!! 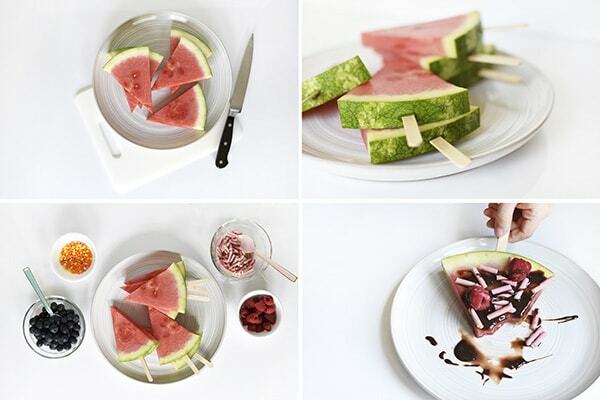 Those watermelon popsicles look soooo good! They might need to become a summer staple!